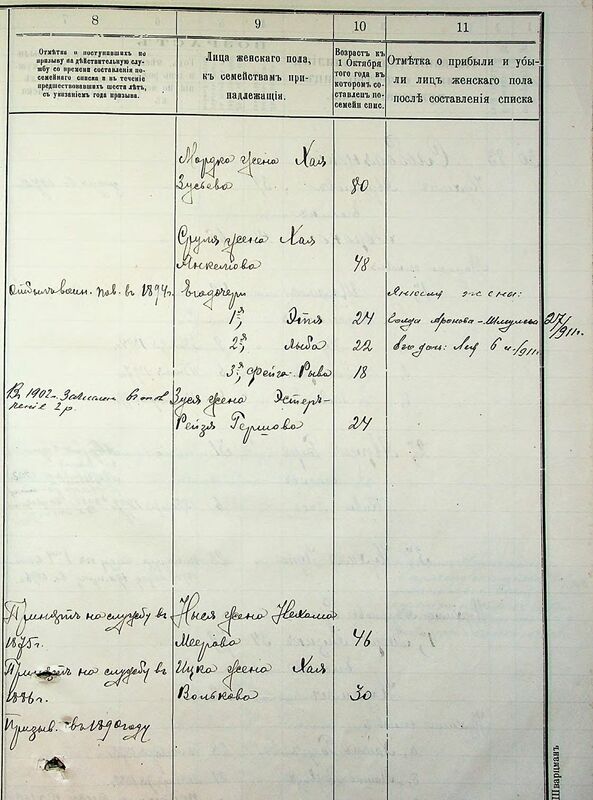 A few years ago I found what looked like my Zubkis family living in Uman in 1811. 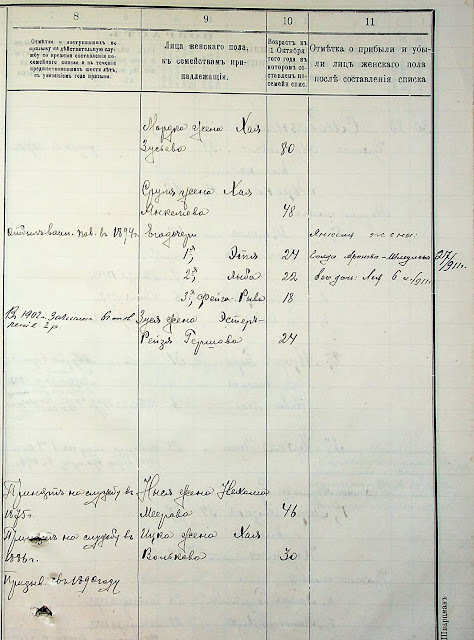 This fall, I found another piece of evidence demonstrating that the 1811 family was, indeed, my great-great-great-great-great (yes, 5 greats) grandfather, listed with his five sons in Uman (the census was of males only). If I could prove that this family was actually mine, then I would have traced the Zubkis family back to 1755, the approximate year of birth for my presumed 5th great grandfather. And now I have another piece of evidence still that points to this being my family. And this, like many recent successes, has been due to having Alex Krakovsky's wiki with scans from Ukrainian archives being consistently added. One of the recently-added items on Alex's wiki page was a 1903 list of Kuna's Jews, which updated an 1858 revision list. I already wrote about finding this document which listed members of the household headed by my great-great-great grandfather here. But that wasn't the only Zubkis family listed in this document. Household #29 was headed by 86-year-old Mordko (son of Yos) Zubkis. 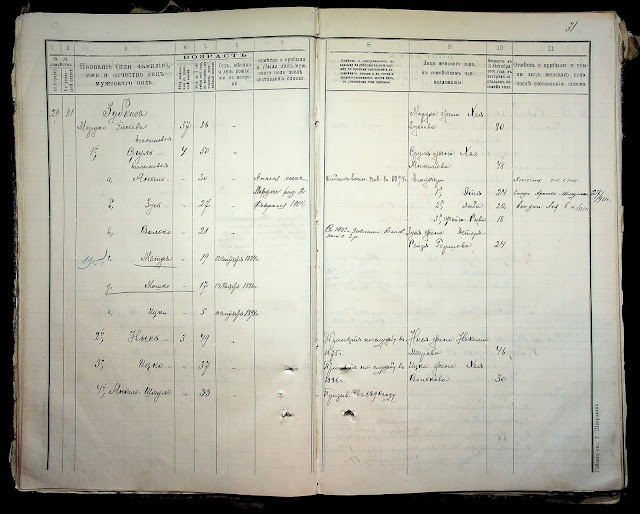 Well, I already knew a Yos Zubkis--he was one of the children in the household listed in Uman's 1811 census, a brother of my great-great-great-great grandfather Shaya. It seems that at least two of these brothers, Shaya and Yos, ended up in Kuna and were registered there. So it looks like the Uman census is of my family, giving me the name of my 5th great grandfather--who would have been born around 1755! There's a lot of information about Mordko's family. He has four sons living with him, and they are listed along with wives, children, and in some cases, grandchildren. 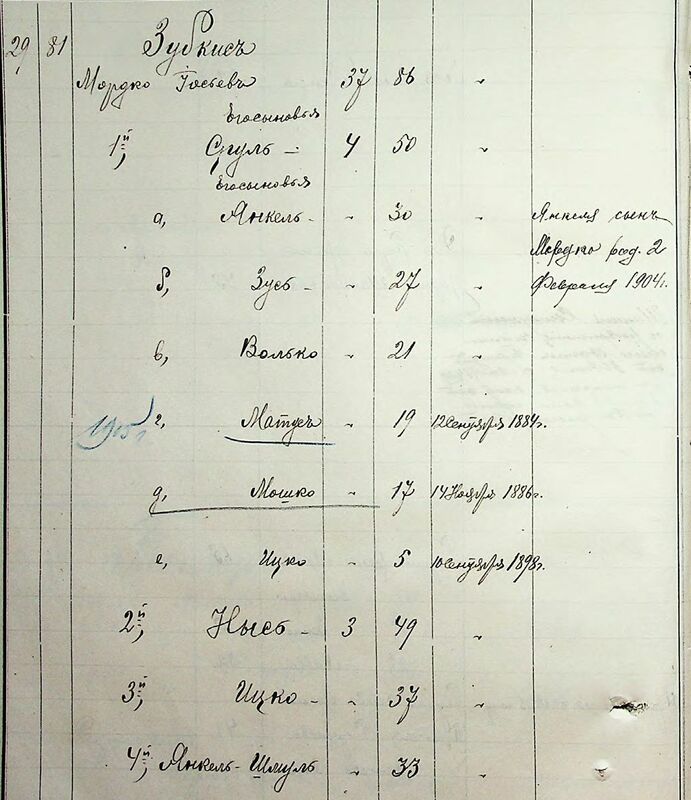 We also learn that some of the sons and grandsons were drafted into the Russian Army between 1875 & 1890. This must have been a confusing household, since not only was Mordko's wife named Chaya, but so were two of his daughters-in-law! And I think I found yet another proof of the Uman family being my family in their pre-Kuna days. So check back, as the saga should continue! Want to get future blog posts emailed to you automatically?